I migrated my website to a new server. I picked up a LoL Shield from Jimmie Rodgers this summer during the KC Makers Faire. 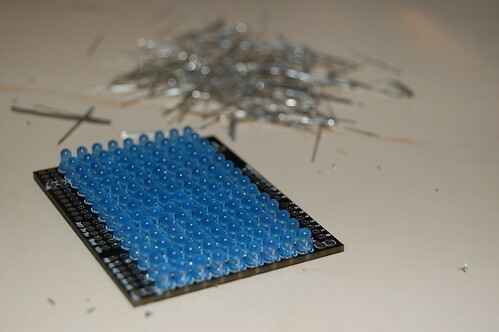 The LoL in LoL Shield stands for Lots of LEDs as there are 126 LEDs in this project. I began soldering earlier this week and finished up this weekend. 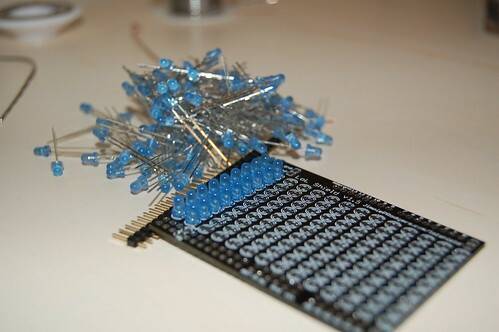 After you finish soldering all of the LEDs on the board, it needs to be connected to an Arduino which I previously purchased for other projects. Above is my finished LoL Shield connected to my Arduino. My MintyBoost in photoed next to it as that can be used to power it when I’m mobile or I can use a USB cable to wall-charger to power it while I’m at work. My current plan is to leave this on my desk at work. It did not take as long as I though to do the project. 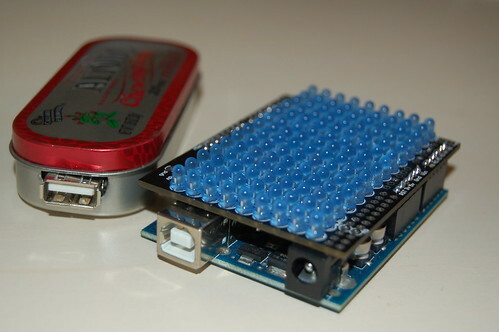 It can easily be done in a weekend plus it gives a person excellent practice at soldering small areas. I did manage to bridge a few solder points but it was easy to fix and I got much better the more I did. If you would like a kit, it can be purchased straight from Jimmie’s website although it looks like only red and green LEDs are currently available. Instructions to make the LoL Sheild can also be found on his website here. There are two websites that I manage, this one (GregMS Universe), and Universal Equipment Inc. The website you are on is very geeky/techie while Universal Equipment, Inc. is a heavy construction equipment rental company. Every so often I look over statistics for the sites to see information about my visitor’s computers such as Screen Resolution, Operating Systems and what Browsers they use and I was surprised by the numbers I saw today. Specifically what surprised me was the trend in browser usage and that is what this article focuses on. For those who don’t know, Boxee is a free cross-platform media center application based upon XBMC. Boxee can scan your network for shared (or hosted) video, music and photo files. It then searches the web for album art for each file and organizes them within Boxee by media type (TV Show, Movie, Music, Photos). The best part of Boxee is its ability to play a wide-variety of Internet content all from within its own application. Instead of going to Hulu.com to watch episodes of Fringe, V or Caprica, you can watch it from within Boxee and if you like the episode, you can recommend it to your other Boxee friends. And now with the latest beta version, video shared from your friends on Twitter or Facebook now show up for you view from within Boxee. The latest version of Boxee is available for Windows, Linux and Mac/ATV. Internet content currently available for all these platforms include Hulu, CBS, Comedy Central, PBS, Pandora, Last.FM, Flickr and much more. The Boxee team has been hard at work and a new version has been released with a plethora of new features. Many of these new features are things I’ve been waiting for. If you were one who has previously held off on upgrading from the Alpha version, it is now time to upgrade! Wait No Longer! Download at: http://www.boxee.tv/download. 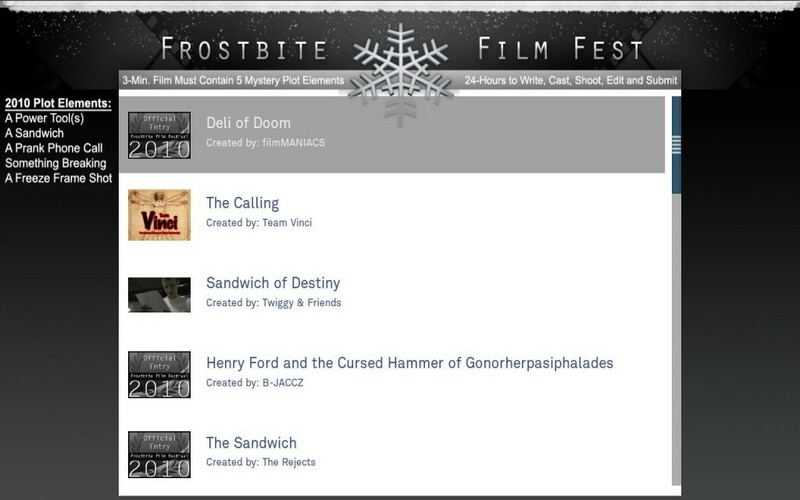 I’ve finished work on the Frostbite Film Festival Boxee Application. It currently contains all of the videos for the 2010 competition. After the required elements were revealed, the participants have 24 hours to: write, cast, shoot, edit, musically score, and submit their original films. Entries are judged based on originality, adherence to the rules, technical quality, and overall entertainment value. More information about the competition can be found on their website: http://www.frostbitefilmfest.com/. To add the application into Boxee, just add the following repository: http://dir.gregms.com and then add the Frostbite Film Fest app. If you have already added the all inclusive third-party Boxee Repository, then the Frostbite Film Fest app is available from there. I’ve finished designing my second application for the Boxee platform. I chose to create it around one of my favorite online web-series The Legend of Neil. 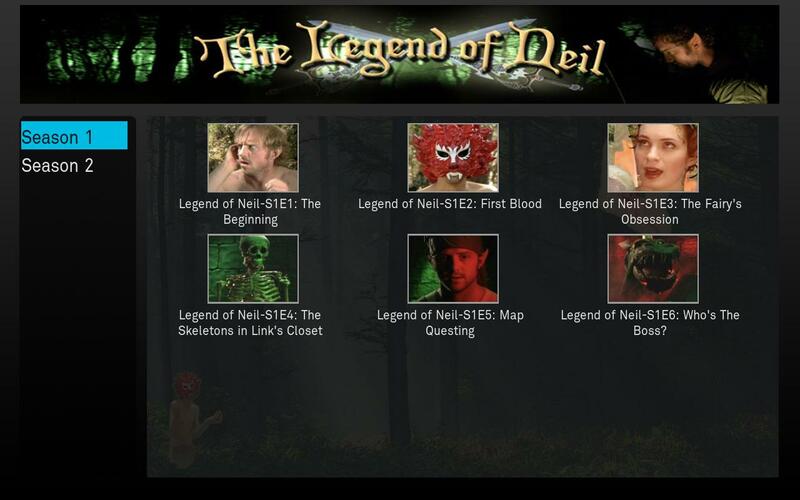 To add it to Boxee, just add the following repository: http://dir.gregms.com and then add The Legend of Neil app. If you have already added the all inclusive third-party Boxee Repository, then The Legend of Neil should now be available. On December 7th in New York, Avner Ronen shown off his companies latest version of their Boxee software. This latest version will bring Boxee out of the Alpha phase, and into the Beta. The Boxee Beta supports an entirely new UI layout and design. The top section contains both local and Internet based media, now all in one click. It also houses the Boxee apps. The feed section to the left combines not only content from your friends on Boxee, but if you put in your Twitter or Facebook login, it will pull in video your (non-Boxee) friends post. The middle is featured content (or apps) recommended from Boxee. At this current time, Boxee is not getting paid for anything here, but they are leaving open the possibility of it. To the right is the queue area. If you find video in Boxee you wish to watch (but you don’t have time to watch it), you can queue it and it will go there. Avner said that there will also be widgets made available to queue video you find on the web that you wish to watch in Boxee later, but he did not demonstrate any at the event. Also, if you have a TV show set to a watch list, new episodes will show up in your queue. One of my favorite new features is the bookmarking feature. While Avner didn’t demonstrate how video gets bookmarked, local video files can now be bookmarked so you can stop watching it, and continue watching at a later time picking back up where you left off. This feature is essential for me to begin moving away from MythTV for local video content. Overall I will be very excited to test this latest version and I plan to do a walkthrough of it just like I have done with previous versions. Invites to test the software will begin going out anytime (if they haven’t already). For anyone not on the list, the software will be made available to the public as an open-Beta beginning in January. I’ve been interested for a long time in developing my own apps for the Boxee platform and over this past month, I finally had a chance to do it. The first app I created is for the round-table technology show Cranky Geeks hosted by none other than John C. Dvorak. For those that watched Dvorak’s show Silicon Spin on TechTV/ZDTV, Cranky Geeks is a similar type of show. But if you didn’t watch, Cranky Geeks is a 30-minute weekly discussion show over technology topics of the week. Sebastian Rupley usually joins him as the “co-crank” along with two other panel members. Some notable panelist have included: Molly Wood, Om Malik, Tom Merritt, Jim Louderback, Harry McCracken, David Spark, Garnett Lee, Leo Laporte, Veronica Belmont, Kevin Rose and Alex Albrecht. To add it to Boxee, just add the following repository: http://dir.gregms.com and then add the Cranky Geeks app. If you have already added the all inclusive third-party Boxee Repository, then the Cranky Geeks app should now be available. My next app will be The Legend of Neil webseries, which is a spoof on the television/video game series Legend of Zelda. It is a NSFW webseries, but very entertaining. Update: The Legend of Neil app is now available: Click here to find out more. In the past several months, I’ve seen a ton of a new video and audio apps added to Boxee and so I decided to do a new walkthrough of the interface and how I use it. The best part of Boxee is its ability to play Internet content all from within its own application. Instead of going to Hulu.com to watch the episodes of Family Guy or Fringe, you can watch it from within Boxee and if you like the episode, you can recommend it to your other Boxee friends. Internet content current available in the Windows, Linux and Mac/ATV version of Boxee include Hulu, CBS, Joost, PBS, Pandora, Last.FM, Flickr and much more.